Here’s the story (Matthew 14: 22-33): the fishermen are headed for home at the end of the night, and it’s stormy, and they can’t see where they’re going. 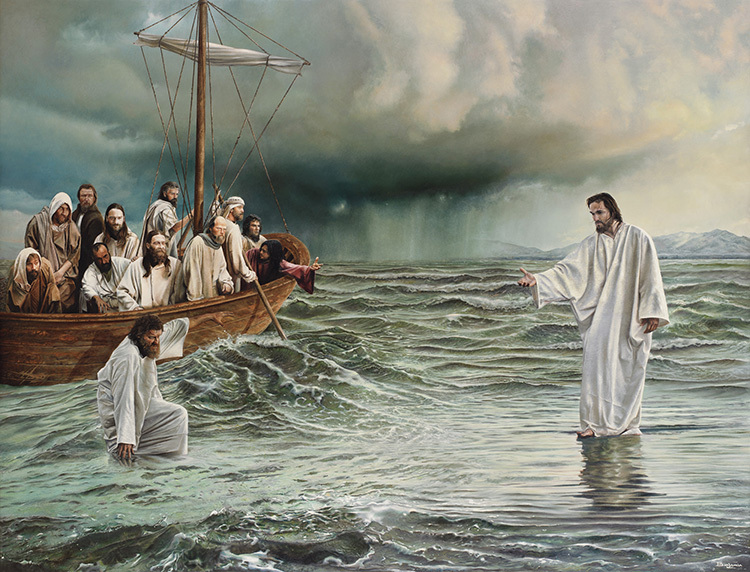 Jesus comes walking out to them on the water – Peter jumps over the side to be with him, starts to sink, and Jesus pulls him up. The text gives the impression that they were well out from shore, maybe a mile, who knows. But there’s no real context for the story, as usual – no perspective, and no resolution. The question is always whether we can find an explanation that allows for basic truth in the story (even if it’s been hyped and spun a little, or misremembered or misunderstood) without contradicting the known laws of the universe. Consider: did Peter now walk the mile back to shore with Jesus? Or did Jesus carry him? Or did one or both get back in the boat, and they sailed in? None of these are mentioned… because none of these needed to happen. The “sea” in the story is the Sea of Galilee, a lake 10 miles wide. Capernaum, where the fishermen lived, is naturally on this lake. The lakeshore there is low and gently sloping, part beach and part marsh. The beach is mostly rock, some sand, the water is shallow for a fair distance. Let’s assume that then, as now, people protected their boats from storms coming up the lake by building a ‘mole’, a wall of loose rocks not necessarily higher than the lake level, out into the lake. It’s still dark, the boat’s coming in to shore in a storm, the fishermen can’t see where the beach is, let alone the mole. Jesus comes walking out on the mole to help. Peter jumps over the side of the boat onto the mole, but then loses his footing and falls in (the water may only have been a couple of feet deep), and Jesus helps him up. Then they help guide the boat to the beach, and drag it up. Years later, when young followers who never met Jesus are asking Peter for stories about what it was like working with him, they get told a slightly exaggerated version. They get, naturally, a fisherman’s story. 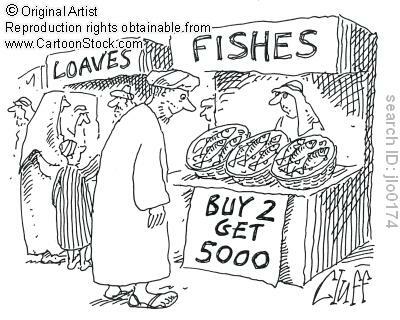 Jesus looks for pricing on a bulk volume deal. His message was always the same: the unity of the Jewish people, the need for purification and submission to the will of God. And he made his points by stories (parables) and by vivid events (stage-managed miracles). When he preached in the countryside he could attract crowds of up to 5,000 people. Obviously he didn’t just start talking, and have that many people show up spontaneously. These were publicized events. As at an outdoor event like Woodstock, some people would have brought food and drink with them, and others wouldn’t. But here there was nowhere to get food if you needed it. Having preached to a large crowd, he would have a small boy come up and offer to share food – “five barley loaves and two small fishes”. He would praise the spirit of the boy, and ask everyone to sit down where they were, and for those who had brought food to share with whoever they were next to. They were all Jews, they were all God’s children, they were all one family. Jesus and the disciples and the whole crowd would share food between them as a communal celebration for one large family, and reinforce his teachings and their bonds as a single chosen people. The miracle was in getting 5,000 people to share their food with strangers. Generally considered Jesus’ first miracle, “turning the water into wine” has captured popular imagination as a casual display of miraculous power – something of a party trick. Which perhaps it was. Here’s the story: Jesus attends a wedding. His mother says they’ve run out of wine, can he help? She tells the servants to do whatever he says. 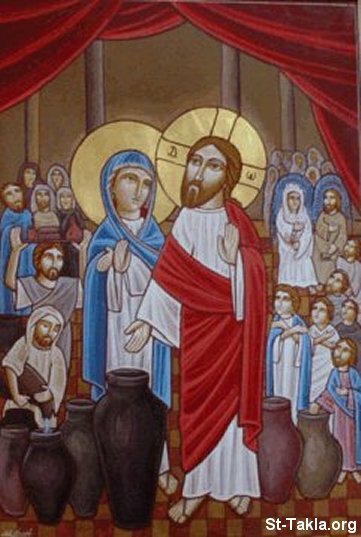 He says to fill some pitchers with water; the liquid is then taken to the Steward of the feast, who congratulates Jesus on saving the best wine for last, i.e. this wine is better than the stuff they had earlier – normally the good stuff would be served first, before everyone is too sozzled to notice the difference. But remember that Palestine was part of the Roman Empire by this time. Consider how Romans served wine at feasts: wine was shipped around the Empire as a concentrate, which reduced shipping costs. The wine steward at a feast had the task of adding the appropriate amount of concentrate to the jars of water, producing something that was the appropriate strength for the company and for the state of the party. If the concentrate was already in an otherwise empty jar, which you then filled with water… Well, it would be a good party trick, especially if it came out at a good strength, and if your guests were village simpletons who weren’t used to attending Roman-style events. Or perhaps everyone knew that it was nothing special, just a bit of fun – and that the only miracle was in having better-tasting (stronger) wine at the end of the party than at the beginning! In The Gospel According to the Romans there is an assumption that Jesus uses street magic to provide an illusion of the miraculous, to reinforce the spiritual lessons he teaches – just as Indian holy men do today.